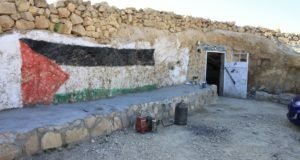 At-Tuwani – In the afternoon of 20 July, the Israeli District Coordinating Office (DCO) delivered stop work orders for nine Palestinian structures around the village of At-Tuwani. 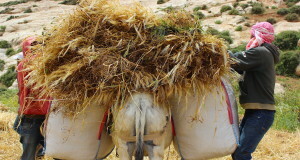 These orders were delivered to seven new houses, one cave, and one cistern in the area. 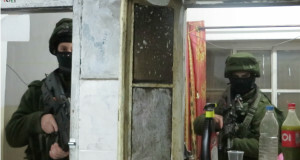 The Israeli military sometimes delivers a stop work order to a structure prior to a demolition order; and after a demolition order is delivered, the Israeli military may then demolish the structure. While the DCO and Israeli soldiers delivered the stop work orders, Palestinian children and adults gathered in the area, protesting the delivery of the stop work orders. One Palestinian admonished the DCO and soldiers to deliver demolition orders to the illegal buildings in the Israeli outpost of Havat Ma’on, which continues to expand. Palestinian children surrounded each house and chanted loudly, attempting to make it difficult for the DCO to leave the orders at each house and making it difficult for the DCO and soldiers to use their radio and phones. In addition, Palestinians sat in protest in front of the military and DCO and prayed together on their land. While delivering the stop work orders, a member of the DCO struck a small child and an Israeli soldier shoved a Palestinian civilian to the ground. In addition, Israeli police arrested a Palestinian man who was present to protest the stop work orders. He is supposedly charged with “threatening soldiers” and remains in the Kiryat Arba police station. One of the houses had already been destroyed in the night of 16 July (see release: New Palestinian House and Olive Tree Destroyed in the Night.) The Palestinian family suspects the house had been demolished by Israeli settlers from the Israeli settlement of Ma’on or the illegal outpost of Havat Ma’on, and the family began rebuilding the home the next day. Despite Israeli settler and soldier harassment to discourage the growth of the village of At-Tuwani, Palestinians remain committed to asserting their right to develop and build their privately owned Palestinian land.